TRIECO is a Natural Soil Saprophyte, which exhibits multifarious activities in the soil. Scientificalty cultured efficient strains of TRIECO give enermous strength to the soil by stimulating soil fertility and improving the Root Rhizosphere.TRIECO is now recognised world over as the farmer's friend for growing vegetables fruit and food crops. FORMULATION TRIECO is produced under highly aseptic condition and is formulated using natural Bio-fixers for its fast recolonisation and multiplication under field conditions. The free following powder formulation ensures minimum strength of 108 i.e. each gram will have millions of multipliable spores. Secondary product from TRIECO multiplication suppress root infesting diseases. TRIECO produces cell wall degrading enzymes like cellulase, Glucanase and Chitinase, which dissolve the cell wall of the pathogenic fungi releasing the protoplasm. CROPS: Cotton, Chilies, Tomato, Sugarcane, Citrus, Pomegranate, Grapes, Banana, Potato, Tea, Coffee, Tobacco, Turmeric, Cardamom, Sunflower and all types of vegetables, Grams, Pulses, Cereals, and Oil seeds, Groundnut, Rice, Wheat, Maize, Tur , Cumin Ginger, Brinjal etc. Dry Seed Treatment : TRIECO Can be used for treating seeds @ 4-8 gms per kg seed as dry seed treatment just before sowing. Slurry Seed Treatment : Mix 4-8 gms of TRIECO in 10ml water and mix the paste/slurry with 1 kg. Of seed and sow. Rhizome/Tuber/Set Treatment : Dip Rhizome /Tuber/Sette required for one acre in TRIECO solution prepared by mixing TRIECO @ 500 gms -1000 gms in 100 litres of water .Air dry in shade for few minutes before planting . Nursery beds: TRIECO @ 500 gms - 1000 gms 100 litres water can be used for drenching nursery beds of (400m2) . Main field (spot applications) : TRIECO @ 500 gms - 1000gms/ 100 liters of water can be used to drench 400 m2 area in spot where wilt or root rot symptoms are observed. Baroadcasting : Mix 1-2 kg TRIECO with 25 kg of organic manure or farm yard manure (FYM) or soil and apply to acre of land. 4-8 gms/kg of seed 1-2 kgs/25 Kgs FYM/acre. 4-8 gms/kg of seed 500-1000 gms /100 lit. Water Nursery drench. 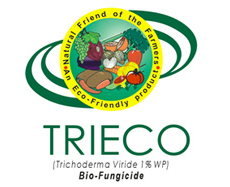 TRIECO is a living fungus, which protects against various fungus, thus before or after applying Trieco do not apply any chemical fungicide to the plant area. Do not leave Trieco powder open under hot sun. If material gets Dried-up, Sprinkle little water over in to maintain moisture content of 15-20%. Protects plant from soil-borne disease/infections throughout the entire season. No repeat dose needed, unlike chemical fungicides. No residues in Food or Soil.